SKU: 20650 Napa Valley. Categories: Occasional Tables, Standard. Tag: 20650. • Design elements include informal Craftsman profiles such as square top edge shapes and square legs with chamfered feet, ganged vertical slat ends, and clean lined top framing around colorful inset slate tiles. • Well thought out function shows through a Rectangle Cocktail with four leatherette upholstered nesting stools that pull out for extra seating, snacks or for family game night. • Likewise, a Nesting End Table offers a small pull-out table for additional surface space. • A Console Table has two shelves and works equally well behind a sofa or for TV display and entertainment storage. 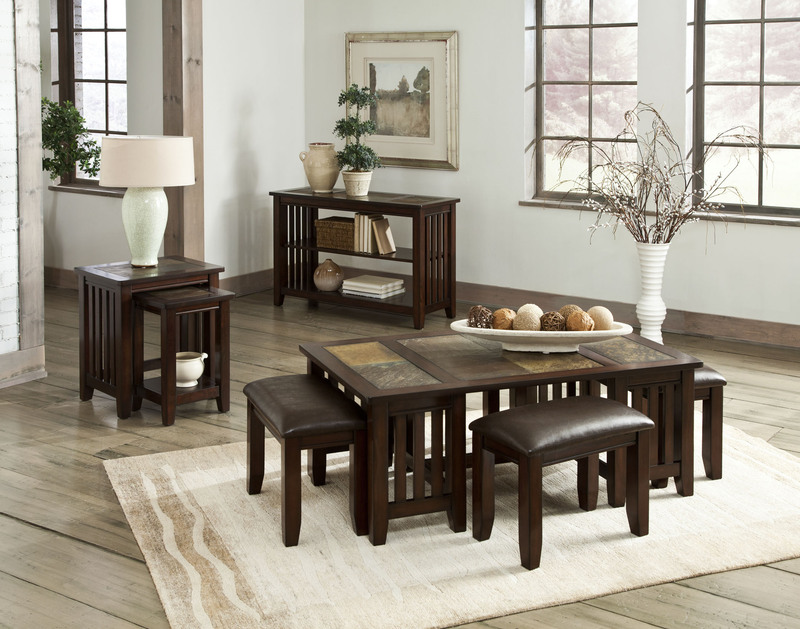 • Napa Valley is constructed of solid hardwood, quartered oak veneers and quality wood products. Easy care tops feature large slate tiles in multi-toned grays and warm gold colors.